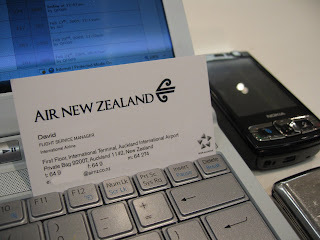 The last time I flew with Air New Zealand, it was on the flagship NZ1/2 London to Auckland and return route and, despite everything I’d heard beforehand, it had been distinctly underwhelming. It was also the most recent long-haul trip I’ve taken in an Economy cabin, the principal feature of which was a seat pitch of 34” – up to 3” more than competitor carriers. It proved, fairly unequivocally, that size isn’t everything and that a little extra leg room is worth a lot less than a comfortable seat. Which, without a shadow of doubt, the NZ seat was not. In fact it was significantly less comfortable than those competitor seats and therefore it proved to be a somewhat pointless move to have swapped allegiances. The London-based transatlantic crews were very good, but the Auckland-based Transpacific crews might just have well worked for a completely different company. Uncommunicative, barely visible and cursory in the discharge of their duties, they’d hardly been great ambassadors for their far-flung homeland. That the same disparity in service applied on the return sectors suggested a diminished likelihood of this having been purely bad luck on my part. Since then however, Air New Zealand have been fervently upgrading their cabins. First Class has been removed and Business Class upgraded to ‘Business Premier,’ with a heavily-marketed flat bed which is licensed from Virgin Atlantic. A Pacific Premium Economy cabin has been introduced, with increased legroom and Business Class catering, and the rearmost Pacific Economy cabin has also been enhanced. Positive reviews and industry awards have flowed and so now was the chance to lay the ghosts of NZ1/2 to rest. Check-in and ground handling at Perth airport is undertaken by NZ’s arch-rivals Qantas, and the initial impressions were, frankly, superb. Business Class check-in was quick, efficient and very friendly. A wheelchair was summoned to the desk swiftly and we were given directions to the Qantas Club in which to relax prior to departure. The lounge has recently been renovated, and to the highest of standards. Although clearly not quite as amenity-laden as its Sydney and Melbourne counterparts, the interior design theme is the same and it looked superb. Having driven up from the South West that day, the first priority was a shower and change into flying togs. The lounge angel provided sealed bales of fresh, fluffy white towels and directions to the shower suites. Spotlessly clean, sensibly-designed and well-equipped, with abundant Molton Brown amenities, they shamed Heathrow Terminal 5’s shabby offerings utterly and completely. Refreshed and re-robed, the food presentations offered a wide selection of options from which to choose – a bowl of nuts with a chilled glass of wine, right up to a very nice curry and rice (although portion-controlled with very dainty plates). In fact, it was only after significant searching that anything less than perfect was identified: the over-buffet canopy made it rather difficult to select anything at the rear of the presentation and, likewise, for the staff to lay anything out at the front, from their access point at the back. Frankly though, I think I’ll let them off on this. The bar selection is equally comprehensive, with expansive chillers and free-pour spirits and there are defined dining, lounging and working areas. All in all, a real superb facility for Perth. Things got better when a smartly dressed gentleman appeared to introduce himself as the Flight Service Manager for our flight. He chatted with all the NZ passengers and invited us, should we need anything at all, to speak to him at any time during the flight. It was a very, very nice touch indeed and one which other passengers seemed to react very positively to. All memories of NZ1 and 2 firmly banished then, and we sat back to await the boarding call, keeping an eye on the unusually informative departure screens, which even include passenger load details and aircraft type. The next PA announcement began with the equally unusual introduction of distinctly-heard giggles, perhaps as the enmity between QF and NZ bubbled through. Qantas were, it transpired, delight…er…sorry to announce a delay to flight NZ174, as someone had stolen an emergency exit sign from the aircraft. With our dapper FSM nowhere to be seen, we sat and waited for further updates. In fairness, it didn’t seem to be all that long before our wheelchair pusher arrived – who in fact turned out to be our friendly check-in agent. We set off purposefully in the hands of our airport expert, who promptly delivered us to a gate two stands away from our aircraft. In fact, not just the gate, but the end of the jetty. It didn’t seem to register that there were no gate staff, no passengers – indeed no evidence of any departing flight whatsoever, so the lack of aircraft and the sheer drop at the end of the jetty seemed to unnerve her somewhat. More fool I for not piping up and pointing out the only Air New Zealand flight of the day sitting two gates along….. Ultimately, we arrived at the correct gate and pre-boarded immediately. Despite this being a 6 hour plus, overnight flight, the 767 equipment used is not fitted with NZ’s much publicised Business Premier flat bed but, rather, a traditional seat faced in aesthetically tasteful (if sweaty in practice) leather. At least NZ are slightly more forthcoming on their website about the hard product on the Perth route than Singapore Airlines are on theirs, but it’s arguably an even greater gulf between NZ’s two Business Class offerings than between the extremes of SQ’s myriad versions. The cabin at least looked smart, clean and fresh, with natty amenity packs and plump pillows on the seats. After the Lounge Angel’s odd announcement, there came a series of equally strange ‘company’ announcements to crew on board, telling them not to allow anyone to sit beyond a certain row number, as the lack of emergency signage at the rear of the aircraft rendered these seats unusable by law. OK, the stolen sign was an out-of-the-ordinary occurrence, but surely passengers seated in the affected areas would be re-accommodated by gate staff, not shuffled around in the confined space onboard? As status and premium passengers began to board, another problem emerged: two other passengers had boarding passes for my seat. Again, how this was missed by gate staff and/or their scanners is a cause for wonder. As I was next to the less-than-sprightly GCC, the other pass-holders were happy to defer and take any other available seat in the cabin of 24 seats. Well, one of them had to move again as the seat he went to was about to be occupied, although crew had directed him there after consulting the pre-board manifest….. Although somewhat isolated from it in the forward cabin, it was obvious from the amount of bing-bonging that all was not well up the back. And, indeed it proved to be, as the next PA asked any passengers seated in the affected, rearmost, rows to move forward into any available seat. So, the gate staff having failed to re-seat them, the rear cabin crew who had been told to stop anyone sitting aft of row X, had also failed to deal with the situation. Cue much chuntering and commotion and, inevitably, passengers appearing back through the curtain and taking Business Class seats. This seemed to faze the crew too, despite passengers plainly having been told to take any ‘available’ seat, until they finally relented. The insurgents were resignedly told that, whilst they could sit in Business, they would get Economy service. Fair enough, except when it ultimately came to it and as we’d already seen, the multiple assignments for the same seat, occupied seat showing available and therefore necessarily-reseated actual Business Class passengers meant that the crew couldn’t tell who’d paid to be at the front and who hadn’t. The whole thing was rapidly shaping up to be a less than divine Kiwi comedy. Our charming-but-by-now-somewhat-flustered FSM made announcements to say that all was now sorted, despite there being passengers standing around, no-sign of doors closing and the scheduled departure time becoming a feint and distant memory. A quick and quiet word with him in the galley, in the hope that we would be just one over and that an offer of my willingness to take a jump-seat to get the lone remainder strapped in and the rubber off the tarmac, revealed that we were in fact still 4 over. It therefore took a further wait for Qantas engineers to come onboard and remove a crew-rest screen, liberating enough seats for passenger use, to get us secured for take-off and a significantly delayed push-back. At least, every now and again during the pre-departure stressing, the offer of a drink from the galley had been forthcoming. Once aloft, service began and the sticky seats were investigated. FCC was horrified to find himself having to exert physical force against the first non-powered premium seat that he’s probably ever had the misfortune to fly in. In fact, he had to be quietly advised that it wasn’t broken, it was merely cheap. Not that it reclined all that far anyway, and the legrest would only support those whose limbs had been truncated mid-calf. The personal TV screens for the on-demand system unfold from the armrest, although despite repeated prodding of the unresponsive touch screen, the system wasn’t working and had to be rebooted. Twice. When the crew eventually defibrillated it into life, it turned out to be rather less on-demand and more ‘on-beg’. A more dysfunctional interface could barely be conceived, made all the more frustrating by NZ’s obsession with practically the only Kiwi TV production to have achieved any international success: The Flight of The Conchords. Apparently, the ‘stars’ of the show bill themselves as ‘Formerly New Zealand’s fourth most popular guitar-based digi-bongo accapella-rap-funk-comedy folk duo.’ They may be right, but being forced to scroll through 42 full-page synopses of each featured episode before it’s possible to watch single showings of little-known offerings like The Simpsons or Fawlty Towers, renders them without a shadow of doubt ‘The World’s most annoying and obstructive act at altitude’. By the time I’d poked the screen 43 times to get to Homer, I’d lost all feeling in my index finger and much of my will to live. Who’s ever heard of a simple menu system? It’s enough to turn one to drink, so just as well that the bar approached (along with the confused crew trying to work out who was legit and who was a refugee from the rear). A swankily-labelled Cable Bay Pinot Noir proved a mistake, putting me in mind of the salad dressing employed by Air Canada, which in itself is strongly reminiscent of aviation jet fuel. After three attempts (the crew in question repeatedly being about to put the plate down and then running away to the galley) a small bowl of undescribed canapes and nuts were presented, a linen cloth having been draped across the table first. This stuttering service proved the norm throughout, from a crew who regularly seemed unsure of what they were doing, untrained in premium service, outfitted in uniforms that looked slightly paramilitary in hue and Primark in quality and, in the case of one crewmember, an inability to pronounce (simple) passenger names. Some people may like casual; I found it sloppy and hardly inspiring confidence that, in case of emergency (and despite the lack of associated signage) this crew would suddenly invigorate and deftly handle a life and death situation. The meal service began with the sole possibility of a smoked salmon and crab parcel which, luckily, was very nice indeed. It arrived with a subtly-labelled pot of dressing…. A main course of, well, do you know what? I can’t remember. Fish, of some description, on pasta. With sweetcorn, as you can see. It’s at this point that I remember that there were no menus. Or wine lists. So, I can’t tell you what else I might have chosen from. I think it was steak, which would have been dandy with that plastic knife. Notwithstanding that, I remember that the fish was tasty, and followed by a very refreshing but tasteless pre-scooped ice cream and then a really very good indeed cheese plate. By that point, acutely aware that the time difference between Perth and Auckland would make this a longish flight through a very short night, I declined coffee or indeed any other service and tried to get some sleep. Which, on that form-over-function clammy leather seat, was pretty impossible. Eyes held shut, I prayed that the Tasman would pass beneath us swiftly and looked forward to feeling the drag of the landing gear being deployed. When the tyres finally touched the tarmac, it was a short taxi to the terminal building, a time filled with profuse apology from the FSM for the delayed departure and arrival. A wheelchair and pusher were awaiting our appearance and it was the by-now customary expedited special-assistance progress through immigration to baggage reclaim. Priority labelling worked flawlessly again and we were then directed along a fast channel through the agriculture check and security and out into the fresh early-morning Auckland air. Whereupon Hertz capped the overnight experience by pulling their usual trick of gifting an upgrade to some hapless early-morning European long-haul arrival, and with it the most lurid beast in their compound, aka The Snot….. Final Verdict for Air New Zealand Business Class: 6.0/10. If the Qantas Club experience had followed through on board then this would have been a superb flight. As it was, an uncomfortable seat, desperately disorganised service, undrinkable wine and tedious IFE could not be compensated for by either the lounge, the pretty good onboard food or the valiant attempts of the Flight Service Manager to smooth over a shambolic operation. The stolen signage was far from NZ’s fault, but their inability to manage the situation was. Poor.